MANILA, Philippines July 20, 2014/GBOD – United Methodist young people from around the world have urged leaders of the denomination to “seek solutions that promote our global unity” and not be divided by issues such as homosexuality. 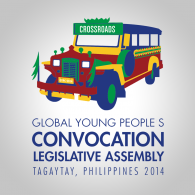 The Global Young People’s Convocation & Legislative Assembly, attended by more than 300 young people and observers, adopted the unity statement the night before ending its quadrennial gathering with a worship service Sunday, July 20, at Central United Methodist Church in Manila. “There has been increasing talk of schism of the United Methodist Church in recent months. Many say that the issue of homosexuality is so contentious that it will inevitably split our Church. We, as the young people of The United Methodist Church, would like to say that we do not desire a divided Church. The gathering, hosted by the General Board of Discipleship (GBOD), was disrupted by Typhoon Rammasun as delegates and observers arrived at a meeting site in Tagaytay, Philippines on July 16. No one was injured, but the entire convocation was moved to a nearby location called Island Cove close to Manila. GBOD’s mission is to support annual conference and local church leaders for their task of equipping world-changing disciples. An agency of The United Methodist Church, GBOD is located at 1908 Grand Ave. in Nashville, Tenn. For more information, visit www.gbod.org, the Press Center at www.gbod.org/about/press-center or call the Communications Office at (877) 899-2780, Ext. 1726. Sign up for our First Friday Newsletter for more information about the World Methodist Council!